Place middle of band under both feet, keeping them hip distance apart. Hold handles by sides, palms facing in. Stand tall with back straight, core fully engaged, arms straight, and feet hip distance apart. To start, take a deep breath, then exhale and raise your arms outwards until they reach shoulder height. Inhale and slowly return to starting position. 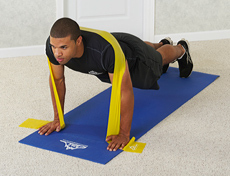 If band feels too heavy, slightly bend elbows throughout movement to protect elbows. Repeat for desired number of reps. Attach anchor at top of door. Facing door, grab both handles in each hand and step away 1-2 feet. Start with arms extended in front, palms facing down, chest lifted and core tight. To start, take a deep breath in, then exhale and pull arms down to your sides, squeezing upper back together at the end of movement. Inhale and slowly release to start position. Insert anchor at top of door on hinge side. Facing door, grab both handles in each hand and step 1-2 feet away. Begin with arms extended in front, palms facing in, chest lifted and core tight. To start, take a deep breath, then on exhale pull the extended arms out and back until they form a T position. Squeeze upper back together at end of movement, inhale and slowly release to start. Take another deep breath then pull arms back and downward, forming an upside down V, again squeezing the upper back and inhale, slowly releasing to start again. Begin in face down position and hold onto band ends, one in each hand. 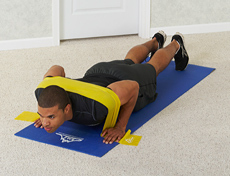 With band stretched across your upper back, place both hands on the ground underneath your shoulders, keeping the band between thumb and index fingers. As you support yourself with your upper body, step back with both feet so you are at the top of the pushup. Keep your back straight, and core engaged. To start, inhale and slowly lower your body until your chest is a few inches from the floor. Exhale and push back up to start. Sit on floor with legs straight and heels together. Wrap middle of band around bottom of both feet and grab the ends of bands in each hand. Sit tall with back straight so that spine is neutral, shoulders relaxed and staying directly over hips. To start, take a deep breath, engage abs, then exhale and pull elbows back. Squeeze shoulder blades together, until both hands are next to rib cage. To start, inhale then exhale as you pull elbows back, squeezing shoulder blades, until both hands are next to rib cage. Insert anchor in door at chest height. Grab handles with both hands, interlacing the fingers. Stand with your L or R side to the door. 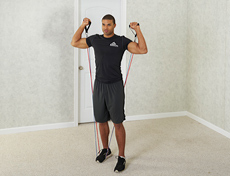 Step away from the door several feet so that, when your arms are extended, you create slight tension in the band. Stand tall with feet shoulder width apart and knees slightly bent. Engage abs so your core is tight. With torso twisted and arms straight, take a deep breath, exhale and pull the band away from the anchor and across your body. Inhale and return slowly to starting position. Repeat for desired number of reps then switch sides. Place the middle of the stacked bands underneath one foot, keeping your feet staggered in a comfortable stance. 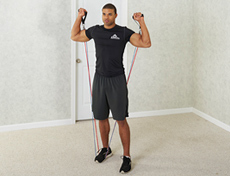 To decrease intensity, use fewer bands. Holding both handles in each hand, bring hands directly above shoulders so elbows point outward. Stand tall with core engaged. To start, take a deep breath, then exhale and press hands towards ceiling until both arms fully extend. Inhale and slowly return to start. 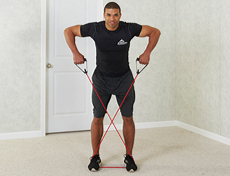 Place middle of stacked bands under one foot, keeping feet staggered in a comfortable stance. Holding onto handles in each hand, bring hands above shoulders so elbows point outward. Stand tall and engage core. To start, take a deep breath, then exhale and press your R hand upwards until fully extended. Inhale and slowly bring the R hand back to start position. Exhale and press the L hand upwards. Continue to alternate R and L, then repeat for desired number of reps.
Place middle of band underneath both feet, keeping your feet hip distance apart. Cross the band in front of you and hold onto both handles. Stand tall and engage core. To start, take a deep breath, then exhale and pull both elbows up until they are slightly above waist. Attach anchor near bottom of door. Holding onto handles, step forward 1-2 feet with feet hip distance apart. Stand tall, engage your core, and keep elbows pointed to sides. Take a deep breath to start, then exhale and raise both hands upwards. Holding handles in each hand, face away from the door 1-2 feet. Place hands above shoulders, one foot behind the other, and lunge slightly forward. The band should be in front of arms to work more of the chest muscles. Back straight and core engaged. To start, take a deep breath, then exhale and press both hands upward at a diagonal until both arms fully extend. Place one end of band under one foot so there’s a short and long end. Continue to hold both handles in each hand. With long end, place hand just above and behind shoulder so that elbow is bent and pointed forward and slightly up. The band should be running up the length of your body behind you. Stand up tall and engage core. To start, take a deep breath, then exhale and raise hand until arm fully extends. Do not move the position of the elbow throughout the movement. Repeat for desired number of reps and switch sides.